I’ve been told the ending of Dare is a cliff hanger. When I was writing it, I actually didn’t intend for it to be a cliff hanger. I saw cliff hangers in the traditional sense where in the last couple paragraphs or line someone runs up and reports “so and so has been kidnapped/captured by pirates/about to be executed” etc. But the more I thought about it, the more I realized that cliff hangers are more than that. So here’s my thoughts on cliff hangers from what I’ve observed. This is not meant to be a how to on cliff hangers or a set of writing rules. Just something to think about. A cliff hanger is a promise. There is a slight difference between the cliff hanger at the end of a chapter and the cliff hanger at the end of the book. With chapter endings, the promise to the reader is vague. The cliff hanger promises that this action or question or emotion will be resolved somewhere in the book, but the author isn’t going to say when. The reader keeps reading to find out. 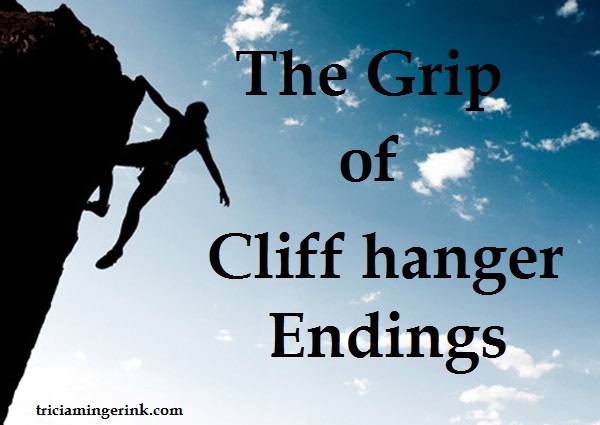 The cliff hanger at the ending of a book almost always is a promise about the next book. What do I mean by that? It means the cliff hanger more or less spells out the plot of the next book. While a reader is left really wanting the next book, they still feel satisfied with the current book. They know the cliff hanger will be dealt with once the next book comes out. This can be very literal (warning, minor spoilers). For example, in Mary Lu Tyndall’s Charles Towne Belle series, the first book ends with the main character finding out that her sister has run away. Guess what? In the second book, the sister is the main character and the whole book is her adventures after she ran away. That book ends with her being reunited with the sister from the first book, only to find out that the third sister has been kidnapped by pirates. Can you guess what the plot of book 3 is going to be? in another example, the cliff hanger can be more of an determined resolve on the part of the characters rather than a literal action. In the Lord of the Rings movies (sorry, switching to movies), The Fellowship of the Rings ends with Aragorn’s determination to rescue Merry and Pippin and Frodo’s determination to keep going into Mordor. The plot of The Two Towers is thus the battles Aragorn and friends end up joining as part of trying to get Merry and Pippin back and Frodo’s quest to find a way into Mordor. That movie ends with Aragorn realizing the main battle is yet to come and Frodo and Sam finally thinking they have a way into Mordor. The plot of The Return of the King is Aragorn fighting the final, big battles and Frodo finally making it into Mordor. Sometimes the cliff hanger promise at the end of a book is simply a question or a concern. The plot of the next book is usually that question or concern playing out. But no matter how a book cliff hanger is done, it is always a promise for the next book. It is not a lack of resolution in the current book. The cliff hanger ending usually happens after the main plot of the book or movie has been resolved. If the plot hasn’t been resolved, then the cliff hanger should be a chapter ending cliff hanger, not a book ending cliff hanger. This is why the ending of the movie The Hobbit: The Desolation of Smaug bugs me (Sorry Hobbit fans. Also, spoiler alert for those who haven’t watched the movies). Don’t get me wrong. I like the movies and I’m not one of those people who is going to rant about the changes they made or that kind of stuff because (for the most part) they made them into good movies and stuck to the book fairly closely. The Hobbit: An Unexpected Journey ends with a more traditional cliff hanger. It shows the bird banging on the rock and Smaug’s eye opening. There. The promise of the plot for the next movie. We know that Smaug is awake and defeating him will be the plot for the next movie. Only, it wasn’t. Not entirely, anyway. The dwarves get to the Lonely Mountain and fight Smaug, then he flies away and makes his “I am Death” speech and Bam! The movie ends. This bugs me for two reasons: 1. It promises to the viewer that the plot of the next movie will be Smaug carrying through with his promise and 2. The plot of The Desolation of Smaug is not resolved since Smaug is not defeated. #2 would be all right if #1 were the case. But, Smaug is knocked off before the opening credits of the next movie. And it cheapens his death. Instead of building up from the tension of the whole movie, Smaug becomes a minor bad guy to knock off quickly in the beginning of the movie so the real fight can begin. We no longer fully care about Smaug’s desolation because we happen to know this movie isn’t about that. It’s about the Battle of the Five Armies that is coming up. The tension is killed. The cliff hanger is a waste of a cliff hanger. That “I am Death” scene was a chapter ending, not a book/movie ending. And before you argue that it is one book and couldn’t be broken up easily, I’ll counter that Lord of the Rings is technically one book and that one was broken up just fine. Plus, they managed to get a good plot arc for An Unexpected Journey. They could’ve done the same thing for The Desolation of Smaug. Really easily, actually. The Desolation of Smaug should’ve included the final battle against Smaug in Lake Town, using the tension that had been building throughout the whole movie so that when that arrow is shot, everyone is curled in their chairs biting their fingernails hoping it will strike true. Then, the movie could’ve ended with the scene of the dwarves watching Smaug fall from the sky when Bilbo turns around and sees that Thorin is starting not to act like himself. There it is. The promise for the next movie’s plot. Because this time, it actually is the plot of the next movie. The Battle of the Five Armies is about the big battle, but it is also Thorin’s struggle with dragon sickness, his fall, and his redemption in his heroic death. I know it would’ve thrown off some of the movie lengths and some of that kind of stuff, and I know a lot of people really like where The Desolation of Smaug ends. But from a purely story-writing look, it wasn’t the place it should’ve ended. If a writer ended a book that way, their fans would be all kinds of mad because the story wasn’t truly over. Nothing was resolved. It is a little better now that all the movies are out and I can watch them pretty much in a row because that way I can pretend the ending of The Desolation of Smaug is simply a chapter ending. In a way, that’s what The Hobbit movies are. They are extended chapters of one story. Still, if you make three movies you are still essentially making three stories and thus each should have their own arc and resolution. Okay, I’ll stop my mini rant now. What do you think? Any thoughts on cliff hangers? I like your philosophy on cliff hangers! I can support this. 😉 And I agree with you on the Desolation of Smaug. He didn’t desolate anything! It really frustrated my enjoyment of The Battle of the Five Armies. There was no point to him even being in that movie! I guess if you think of book/movie series in terms of one big story, and each episode in terms of an Act, cliff hangers could be plot twists? We”ve figured out what we think is the problem, only to discover there’s more to the story or an added layer to the problem? I like that take on cliff hangers too! A lot of cliff hangers, especially in a series with a continuous story line, do end up plot twists that take an entire book to unfold! I never thought of cliff hangers like that. Good to keep in mind for my writing… And I guess I see your point about the Hobbit, but I’m a big fan I didn’t really see anything wrong. Now looking at it, I do see you point. Don’t get me wrong, I did like the movies. That one part just rubbed me wrong a little bit. I guess it’s my internal story editor making it hard to watch a movie without analyzing it. I sometimes envy people who can watch movies without being rubbed wrong whenever a plot point doesn’t work quite right. 😉 The movie still had a cool ending, but I guess I didn’t think it was the best one. I totally agree with you about the Hobbit. I told my siblings the same thing after we watched the Battle of the Five armies. Really the only cliffhangers I don’t like are the ones that end in the middle of a scene. It seems like the author is trying too hard to get you to come back and read the next book. For example, in one series I read, the first book ended when the MC fell out of a ship into a stormy sea. The second book ended right in the middle of a rescue mission. Like, RIGHT in the middle. Very annoying. Exactly! No resolution to the plot! But in some cases, it works. I think you read the Heroes of Olympus series? The end of The Mark of Athena has a huge cliff hanger (kinda literally), but it fit because the plot (getting that statue) was resolved, just part of the resolution ended up setting up the next book. Cliffhangers make sense now. And I can understand some of my problems with the Hobbit movies. I kind of felt like killing Smaug at the beginning of TBotFA was tacked on and out of place. And I personally think there wasn’t really enough story to stretch to three movies. LOTR was better done. I agree, which leaves an interesting debate I guess. If there wasn’t enough for three movies, how would you go about it? I’m not sure I would shrink it into one movie. That worked with LotR, but those books have extra wiggle room because of the gorgeous writing and descriptions. The Hobbit is a much more sparing book, so more action and necessary plot points are packed into a smaller space. But if it were two movies, where could you break it up with a proper plot arc? I’ll have to think about that one. I do agree. LotR was better done. It must be the curse of the prequel movies or something. I really don’t like the prequel Star Wars movies. I can’t even rewatch them because it is hard to connect with a character who I know is just going to turn a villain, and I don’t even like him that much to begin with. At least the Hobbit movies had a likeable main character. That’s a step in the right direction at least. It is an interesting idea to consider that we always think cliff hangers increase tension, but sometimes (as in the case of Smaug’s death in the movies) it actually kills it. Sometimes its better to keep the flow going and increase the tension that way. Prequel movies might just be under a curse. The Star Wars movies are horrible. I’ve only seen the third once and that was because it was playing on tv.